Numbers are inevitable when talking about cars. Whether it's dimensions, horsepower, wheel size or seat count, each category has a number attached to it — and it's often used to trump a competitor. There's a number Dodge (and other makers of big crossovers) would probably like to brush under the rug: 75, as in $75 to fill the tank of the redesigned 2011 Durango I tested. The price for a gallon of regular gas in the Chicago suburbs was $3.65, and my total would have been a little higher had I not reached the pump's limit for credit-card transactions. The Durango is a remarkably well-mannered, high-quality seven-seat crossover suitable for a family road trip, but its fuel economy — typical for its size — is a big liability. I tested the most efficient version of the Durango available: a rear-wheel-drive model with the base V-6 engine, which is rated 16/23 mpg city/highway. It was a midrange Crew trim level, which starts at $33,195, but plenty of technology options pushed the as-tested price to $41,485. The previous-generation Durango had an odd look to it from certain angles, but the 2011 model is considerably more stylish. Dodge designer Mark Trostle repeatedly used the word "proportion" when describing its looks. It does indeed have nice proportions, and the design is enhanced by a new take on Dodge's signature crosshair grille that gives the Durango an intimidating stare. The sides and rear are less memorable, and the design seems to sag slightly behind the rear wheels, but on the whole it's attractive for a big crossover. Previous Dodge interiors didn't do the brand many favors. They were rightly criticized for their uninspired design and rudimentary construction that significantly trailed the competition at a time when design and interior quality were becoming more important to consumers. The redesigned Durango's all-new cabin is a big improvement over the old model's lackluster one, and it's among the best in the segment. It's amazing what a few years and a full redesign can do. One of the things I like most about the Durango's new cabin is that Dodge didn't forget about the little details — an oversight for which it used to be notorious. Smooth finishes on plastic trim pieces like the door pockets and armrest storage release button might not seem like much, but they go a long way toward raising the overall feel of the cabin — a space that already benefits from high-grade materials and good panel fit. In addition to style, this Durango has substance. The front bucket seats are comfortable, and even though the step-in height isn't excessive, you get a commanding view of the road. The seats are supportive — especially for your thighs — and were finished in optional leather (upscale cloth upholstery is standard). The second-row bench seat doesn't slide, but its fixed position has more usable legroom for adult passengers than the second row in the redesigned 2011 Ford Explorer. The Durango is just a few inches longer than the Explorer but features a wheelbase that's 7 inches longer. Longer wheelbases tend to provide more room for passengers, and that's the case here. Meanwhile, the two-person third row can handle adult passengers in a pinch, thanks to decent headroom, but it's best suited for children. 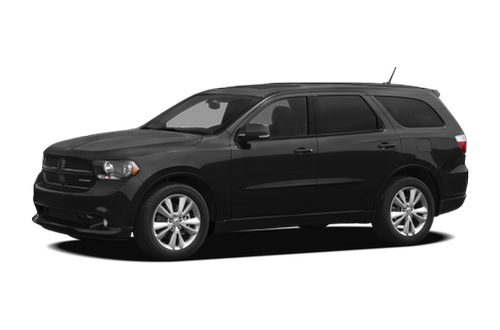 The highlight of the new Durango's driving experience is, without question, its ride comfort and overall poise. The Durango's foundation is a good one, as it shares its platform with the recently redesigned Jeep Grand Cherokee, which is 10 inches shorter. Those roots are evident the moment you get behind the wheel. For a large three-row crossover, the Durango handles well. There's some body roll when cornering, but it always feels planted and stable. There's none of the tipsiness that many SUVs of a decade ago exhibited. The Durango's confidence-inspiring steering yields arrow-straight tracking and smooth lane changes, aiding highway cruising comfort. Some drivers might be intimidated by the Durango's large dimensions, but know that this crossover is as easy to drive as one of Chrysler's minivans, and it's right there with the Chevrolet Traverse and the Explorer. I was the lone occupant during my test, but the Durango is relatively quick off the line and didn't have any trouble keeping pace with fast-moving highway traffic. That's thanks to the standard 290-horsepower, 3.6-liter V-6; it's a smooth-revving engine, and it moves the Durango well. The only time it felt sluggish was when accelerating from midrange speeds with the five-speed automatic in one of its higher gears. The automatic shifts smoothly, but it can pause for a moment when you want it to kick down to a lower gear. The rear-wheel-drive V-6 version is rated 16/23 mpg. The rating drops to 16/22 mpg when you add optional all-wheel drive. With the optional 360-hp, 5.7-liter V-8, it's rated 14/20 mpg with rear-wheel drive and 13/20 mpg with all-wheel drive. If you need to tow a heavy trailer, the Durango's capacity will more than make up for its slight fuel economy disadvantage. When properly equipped, the V-6 Durango can tow up to 6,200 pounds — significantly more than the Traverse (5,200 pounds), Explorer (5,000 pounds) or CX-9 (3,500 pounds). If you need to tow something heavier still, the V-8 Durango is rated for a maximum of 7,400 pounds (RWD) or 7,200 pounds (AWD). Unless you're eyeing a Chevrolet Suburban or Ford Expedition EL, most three-row SUVs and crossovers don't have a lot of cargo room behind the last row of seats. In the Durango, the cargo area with all the seats upright is 17.2 cubic feet — a bit more than you'd find in your average family sedan. There's a bin under the cargo floor if you want to hide smaller items from view. It's easy to fold the 50/50-split third row with one hand. It drops level with the cargo floor and expands the volume to 47.7 cubic feet, which is a little more than you get in the Explorer when its third row is down (43.8 cubic feet) but less than the 68.8 cubic feet of space behind the Traverse's second row. Standard safety features include side-impact airbags for the front seats, side curtain airbags for all three rows, antilock brakes, an electronic stability system, and trailer-sway control. Optional features include a blind spot warning system, rear cross-path detection, adaptive cruise control with an integrated collision warning system, a backup camera, and rear parking sensors. For a full list of safety features in the Durango, visit the Standard Equipment & Specs page. Dodge has had a busy 2011 model year, remaking models like the Charger full-size sedan, Journey crossover and Durango, to name just a few. The 2011 Durango is proof that the brand can compete with the best, but it enters the market at absolutely the wrong time thanks to circumstances not of its making. There's no telling what gas prices will do in the future, but the recent run-up that's brought the national average close to the historic highs of just a few years ago will weigh on car shoppers' minds in the months to come, putting pressure on the Durango and other large crossovers. In this environment, the V-6 Durango's slight gas mileage disadvantage versus prime competitors may be reason enough for some people to cross it off their consideration list. That would be a shame, because the Durango does many things well.